The bar is a narrow strip with about 3-4 tables, transparent tables, leather swivel chairs of the 70s and dimmed yellow lights. 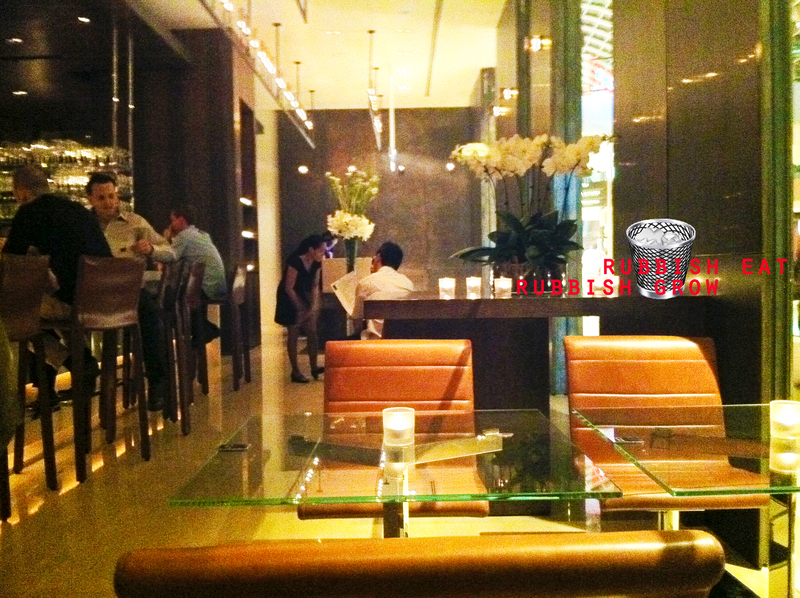 Chic and sophisticated and classy, although the bar is just beside the corridor and people can and do peep in. I felt violated. All cocktails are at $26 at the bar and they have very unique concoctions. 14K ordered Fog Rolling Over Mt Fuji and I ordered the Samurai Sword. Mine is a single-malt whiskey, yamazaki, with honey and ginger. The combinations weren’t mind-blowing, but at least they are fun. We also ordered steak sandwiches ($28). If you want, you can throw in fries or onion rings ($14). Actually if you eat like this, you might as well eat in the restaurant, which is slightly more expensive than the bar grub. Anyway, the steak sandwiches had a very complex and interesting taste – it’s like rainbows, having a little of everything; it’s sweet with teriyaki sauce and salty (too salty for me). 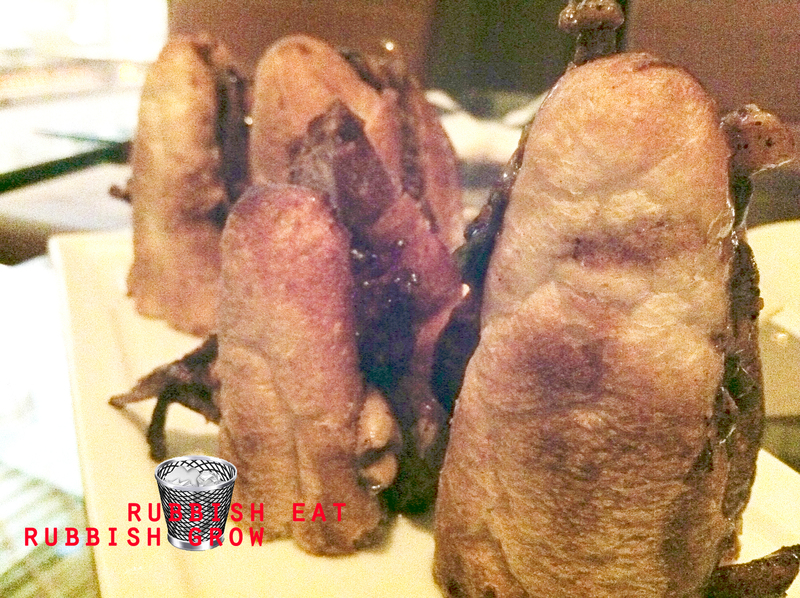 There was something in it–was it caramelised onions or mushroom–that made it extra delicious, sweet and musky. The baguette, though crispy, were rather tough. Overall, tasty but could have been less salty. But both 14K and I decided we should come back for the main restaurant after tasting the steak sandwiches, which says a lot for the standard of the sandwiches. One strange thing is the music. Rock music – seriously, at a classy bar? The service was excellent, one of the best. The Pina waitresses were attentive and polite. Overall, as a bar, it has great service, interesting drinks, great decor, but the chairs were too far apart for any intimate talking. And you can’t move the chairs because they are too heavy. you so atas!! I thought you say you singapore boy! You bluff me one. can…but bring you to tanglin halt market eat the western food stall steak there. very delicious and $5 or so only. Singapore boys go to markets or Jack’s Place. Atas boys go to Cut. haha i dun like jack’s place. cut got ambience mah and its wolfgang puck leh!! You’re Atas Boy from now on! that’s your nick.